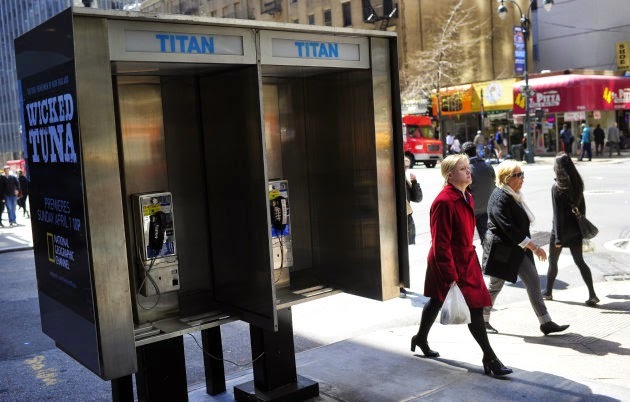 I've been seeing strange things happening to NY phonebooths over the past year or so. Suddenly a booth would appear, wrapped in a piece of sheet metal with a large sticker ad adhered to the entire three sided surface. It was strange because the installation covered what were three regular and working advertising boxes, for seemingly no reason. Well that reason has been revealed to be the installation of a Gimbal beacon capable of communicating with your smart phone and collecting passive data used to build a user profile. I'm glad to finally know why these strange phonebooths have started appearing and sad to know its part of a larger push to make advertising more effective, and invasive.